Rugs can be tricky business. One one hand, they are one of the quickest ways to warm up and transform a room due to their textures, colors and patterns. In addition, they can act as a grounding force in a room by pulling several colors together, and they can anchor seating areas in large spaces as well. On the other hand, rugs can be expensive. They're an investment even if you find a good deal on one. Plus, all of the options out there can be dizzying; sometimes it's hard to find just the right way to warm up those bare floors. And then there's all the dos and don'ts of caring for an area rug so it will last a long time. To help, here are some rug hacks (i.e. borderline-genius but simple solutions) to all of your rug problems. Like, did you know that you can make a rug non-slip by applying a few lines of silicone caulk to the back? And have you heard that placing ice cubes in all of the indentations in your rug left by heavy furniture can make the pile plump up again? Here are some other tricks to help you solve common rug issues. Problem: Despite looking everywhere, you can't find a rug in just the right pattern and color. Solution: Stencil your own custom rug! Sometimes want you want may just be too specific and hard-to-find. When that happens, you can custom-paint a rug to fit your color and decor perfectly! Just look for a flat pile or flat-weave rug, pick a simple pattern and go to town! Solution: Use dye to turn it into a trendy style. Most of us have a faded, worn Oriental rug somewhere in the house; perhaps there's one lying in your basement.. But did you know you can give it new life with a dye treatment that will transform it into one of the hottest trends in rugs? The process of overdying results in a rich, saturated color that still allows the original pattern to peek through. 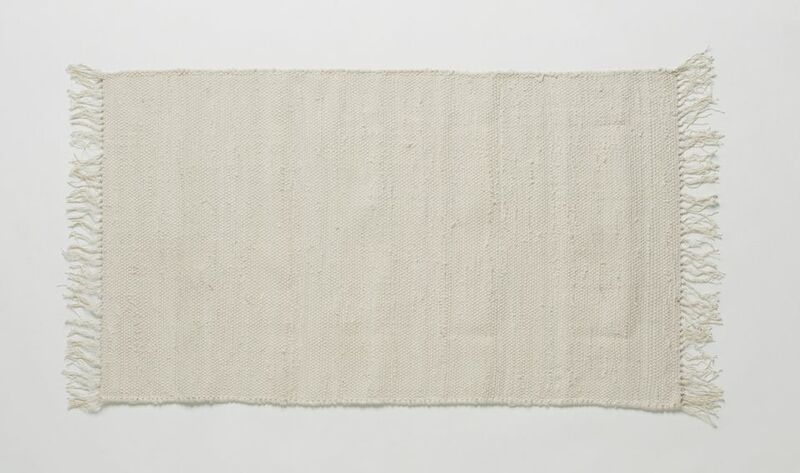 Overdyed rugs are generally pretty expensive, so you'll save a bundle upcycyling that relic from your first apartment. Problem: The rug you love isn't big enough for your room. Combine two smaller rugs into one large one to achieve a size that's proportional to the space you need it to fill. This works best with organically-shaped rugs that don't have a tightly-bound edge. Shag rugs are a great choice for this project because the high pile will hide the seam down the middle. Be creative! Use three or four bath mats to create a runner or a small throw rug, or turn two medium-sized flokati rugs into one luxurious statement piece for your dining room. Problem: Your rug won't fit because the space is awkward or you'd like a rug both inside and outside your back door. Solution: Cut it in half! This clever hack frees you from the confines of standard rug sizes and shapes. By cutting a rug in half and shaping the edges, you can create a rug that fits your needs. Coir mats are great for spots where you'd like an outdoor rug to transition indoors, and they can be cut fairly easily with a box cutter. You can also try this with a rug that is strictly for indoor use, but you'll likely have to take it to a carpet store to have the edges bound again. Problem: You'd like to try the cowhide trend, but don't want to spend a small fortune on it. Solution: Fake the look by making a faux cowhide rug out of fabric instead. Reduce the risk of wasting money on a trend you may grow tired of in a year or two by spending a lot less on this DIY version of a cowhide rug. This solution gives you the chance to try it out with an investment of more time than money; you may decide you love the look and start saving to buy the real thing down the road. Use this type of "rug" in low-traffic areas because it's likely to shift around quite a bit. Anchor it with furniture to help keep it in place. Problem: Your rug is too plain but you don't have the patience to try painting it. Solution: Draw a pattern on with a permanent marker! Geometric, Aztec-inspired motifs are super-popular right now and are easy to replicate, even for beginners. Recreate a simple black and white pattern of lines and small shapes on a rug with shorter pile for results that will fool even the most discerning eyes. Problem: You're on a budget. Solution: Use carpet squares to create an area rug! Problem: You have wood floors everywhere and need to warm them up, stat. Solution: Turn a favorite throw blanket into a rug! Give literal meaning to the phrase "throw rug" by turning an actual throw into an area rug. Sew non-slip fabric directly onto the back of a throw as a simple solution for bare floors. Throws that have a flat, dense weave and are finished with fringe work the best for this fake-out.